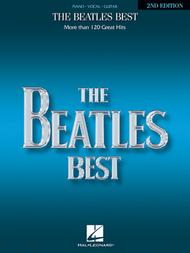 Beatles Best - 2nd Edition by The Beatles. For Guitar, Piano/Keyboard, Vocal. Piano/Vocal/Guitar Artist Songbook. Classic Rock, Pop Rock and Psychedelic Rock. Difficulty: medium. Songbook. Vocal melody, piano accompaniment, lyrics, chord names and guitar chord diagrams. 512 pages. Published by Hal Leonard (HL.356223).ISBN 0881885983. With vocal melody, piano accompaniment, lyrics, chord names and guitar chord diagrams. Classic Rock, Pop Rock and Psychedelic Rock. 9x12 inches.All new piano/vocal arrangements of more than 120 of the Beatles greatest hits. A truly remarkable collection including Help!, Hey Jude, I Want To Hold Your Hand and many, many more.